↑ "Includes data for Pakistani territories of Kashmir; Azad Kashmir (13,297 किमी2 या 5,134 वर्ग मील) and Gilgit–Baltistan (72,520 किमी2 या 28,000 वर्ग मील). Excluding these territories would produce an area figure of 796,095 किमी2 (307,374 वर्ग मील)." ↑ James Minahan (23 December 2009). The Complete Guide to National Symbols and Emblems [2 Volumes]. ABC-CLIO. प. 141. ISBN 978-0-313-34497-8. ↑ "The State Emblem". Ministry of Information and Broadcasting, Government of Pakistan. ओरिजनल से 1 July 2007 के पुरालेखित. पहुँचतिथी 18 दिसंबर 2013. ↑ "National Symbols and Things of Pakistan". Government of Pakistan. ओरिजनल से 13 April 2014 के पुरालेखित. पहुँचतिथी 27 May 2014. ↑ "SC orders immediate implementation of Urdu as official language". The Express Tribune. 7 September 2015. पहुँचतिथी 8 September 2015. ↑ "Pakistan to replace English with Urdu as official language". The Express Tribune. 29 July 2015. पहुँचतिथी 8 September 2015. ↑ Irfan Haider. "PM, president to deliver speeches in Urdu on foreign trips, SC told". dawn.com. ↑ "Population by Mother Tongue". Population Census Organization, Government of Pakistan. ओरिजनल से 12 सितंबर 2011 के पुरालेखित. पहुँचतिथी 28 December 2011. 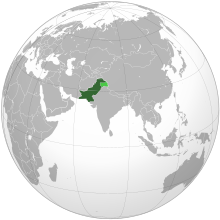 ↑ 13.0 13.1 "Pakistan" The World Factbook — Central Intelligence Agency. ↑ "Pakistan statistics". Geohive. ओरिजनल से 6 April 2013 के पुरालेखित. पहुँचतिथी 20 April 2013. ↑ 18.0 18.1 "Pakistan". International Monetary Fund. पहुँचतिथी 15 January 2017. ↑ "Pakistan is now a $300-billion economy". The Express Tribune. 18 May 2017. पहुँचतिथी 18 May 2017. ↑ "GINI index (World Bank estimate)". World Bank. पहुँचतिथी 28 February 2017. ↑ "Human Development Report 2016" (PDF). United Nations Development Programme. 2016. पहुँचतिथी 26 मार्च 2017. ↑ Faryal Leghari (3 January 2007). "GCC investments in Pakistan and future trends". Gulf Research Center. ओरिजनल से 11 January 2012 के पुरालेखित. पहुँचतिथी 12 February 2008. ↑ Contextualizing Entrepreneurship in Emerging Economies and Developing Countries. Edward Elgar Publishing. 2017. प. 133. ISBN 978-1-78536-753-3. ↑ Tavia Grant (8 December 2011). "On 10th birthday, BRICs poised for more growth". The Globe and Mail. Toronto. पहुँचतिथी 4 January 2012. ↑ Henneberry, S. (2000). "An analysis of industrial–agricultural interactions: A case study in Pakistan". Agricultural Economics. 22: 17–27. doi:10.1016/S0169-5150(99)00041-9. ↑ 28.0 28.1 "World Bank Document" (PDF). 2008. प. 14. पहुँचतिथी 2 January 2010. ↑ "Pakistan". atlas.media.mit.edu. पहुँचतिथी 4 March 2017. ↑ Hamza, Abrar (16 July 2016). "Pakistan's trade deficit widens to 35-year high in FY16". Daily Times (Pakistan). पहुँचतिथी 14 February 2017.